Works like a charm, every time. It helps if your house sits out in the middle of a field with only a porch light. 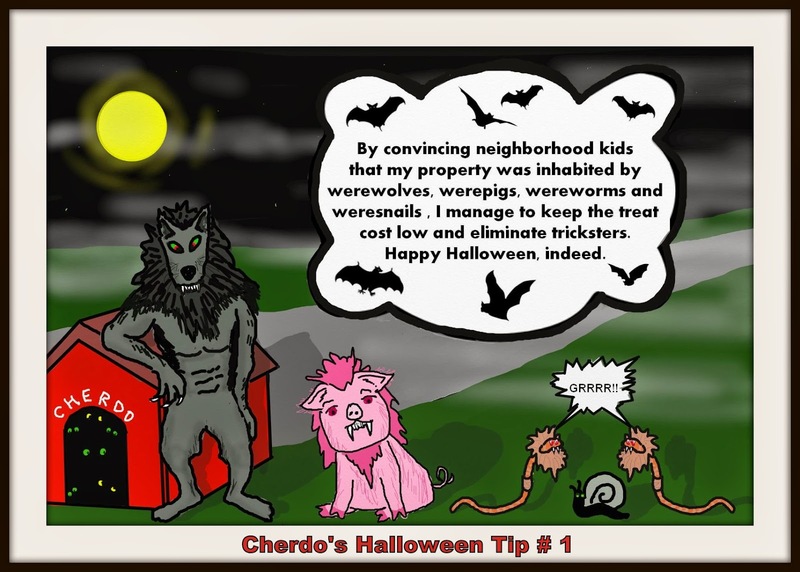 This has been a Public Service Announcement of Cherdo on the Flipside. You're welcome, peeps. No such luck for me, dear Cherdo. I live in a subdivision that's a mecca for trick-or-treaters. Large numbers of kiddos come to my house every Halloween. They arrive on buses, vans, flatbed trucks... trains and boats and planes. (Yessum, I sometimes spot a Tennessee license plate.) I bought 300 pieces of candy to handle this year's zombie apocalypse. If my supply runs out I'm a goner. Have a great day, Shady-o-lantern! The first year I was here, I was prepared with a big bowl of candy. I'd go to the door and try to give a piece to each child. Before I knew it, their grubby little hands were grabbing as many pieces of candy as they could hold. That was my last Halloween giveaway. I felt dirty and assaulted. You're up early this morning. Or maybe you're STILL up and didn't go to bed yet! I was up early yesterday and again this morning. I have a case of "the worries." I'm not even sure what I'm worried about. Maybe it's because it's much cooler and Harper isn't here to sleep with me. Poor Harper, I am still so sad for you, dear Janiekins. You should be getting a little present from Cherdo in the mail soon. Me? You don't know my address. Or did I reveal it in my sleep? I used to call my DIL Jessiekins. How I loved her. Oh, I do be having your address (you emailed me). We used to get over 160 kids and some were not kids any more but I liked that. I also laugh at the 6month old trick or treating with daddy. I smile and say here is some candy for daddy....and not that type of candy either! The neighborhood that my drive connects to gets tons of kids. They're just afraid to come down my drive. Whimpy kiddos. Getting scared should be part of the fun, right? Big non-kids ruin it. That'll teach 'em! Now I know why everyone says you're so much fun! It's nice to meet you, Cherdo! I'm your newest follower! Hey, Julie! Great to have you aboard - I love new followers! Let's laugh a little, shall we? I don't get any trick-or-treaters where I live, haven't for years, and I actually miss them! If the truth be told, the Halloweeners are just afraid of my house's location - I don't actually try to keep them away. If I have one or two, I'm lucky. Most years produce zero, so I go to the Halloween festival to see the costumes. That's what it's all about, right?